Here is a great dish to serve up for a curry night, or to feed a crowd. 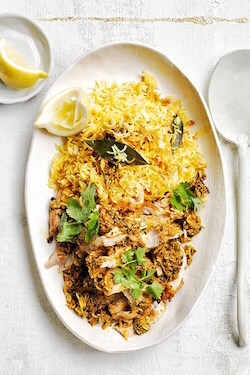 It’s an easy version of biryani, as the prepared Chicken Curry is simply layered with Saffron scented rice and then baked in the oven to warm through. Prepare the day beforehand and then simply pop into an oven. Alternatively, you could even serve the Chicken Curry and the Saffron Rice as two different dishes. We like things spicy, so don’t hesitate in changing the amount of red & green chillies you use to suit your own spice scale. Enjoy!! * If you prefer to use the Steamer Basket Method of steaming rice, please follow the TM31 method for the Saffron Rice recipe below. As only 350g of rice can be cooked in the steamer basket for both the TM5 & TM31, please ensure that you only use this quantity, if using the Steamer Basket Method. Weigh 500g rice into a mixing bowl and wash and rinse the rice four times, changing the water each time to release any starch. Measure 650g water into TM bowl. Add butter, cardamon, cloves, star anise, saffron threads, and salt. Start AUTOMATED BOILED RICE programme, to heat water. Add the washed and rinsed rice and continue AUTOMATED BOILED RICE programme, to cook rice. Once programme has completed, immediately spread rice over a baking tray to allow to cool, fluffing & separating the rice grains with a fork as you remove from bowl. Place ginger, garlic & red chilli into TM bowl and chop 10sec | SP5. Set aside. Add oil and heat for 2 min | VAROMA | SP 1. Add cumin seeds and heat for 2 min | VAROMA | SP 1. Add chopped ginger/garlic/chillies, cardamon, cloves and sliced onions and sauté – 10 min | VAROMA | Reverse | SP 1, stopping to scrape down sides at 5 min. Add tomatoes and continue to cook – 5 min | VAROMA | Reverse | SP 1. Insert BUTTERFLY. Add diced chicken and cook – 10 min | VAROMA | Reverse | SP 1. Place empty Steaming Basket onto lid to prevent sputtering. Add turmeric, chilli powder and salt and continue to cook – 5 min | 100C | Reverse | SP 1. Add yoghurt, garam masala and green chillies and cook – 10 min | 100C | Reverse | SP 1, until oil is released from curry, indicating that the chicken is cooked through. Season to taste and our into a large bowl, stir in peas (if using), and let cool. Oil a large 5L casserole dish. Spread one third of the Saffron rice onto base of casserole dish. Cover with half of the chicken curry. Sprinkle with 3 tbsp chopped coriander leaves and 3 tbsp mint. Repeat another layer with one third of the Saffron rice, half of the curry mixture and 3 tbsp chopped coriander and 3 tbsp mint. Spread remaining rice over chicken and cover tightly with alfoil. Heat in a 180C oven for 35-45 minutes, or until warmed through. Serve with remaining chopped coriander, mint, yoghurt and a squeeze of fresh lime juice. Weigh 350g rice into a mixing bowl and wash and rinse the rice four times, changing the water each time to release any starch. Strain through TM basket and mix in cardamon pods, cloves and star anise into rice. Place 900g of water, butter, saffron threads and salt in TM bowl and insert basket with rice. Cook for 14 minutes at Varoma temperature on speed 4/5 (turn speed up until water is rinsing over rice in basket), with MC off, until rice is just tender. immediately spread rice over a baking tray to allow to cool, fluffing & separating the rice grains with a fork as you remove from bowl. Prepare Chicken Curry for Pilaf. Season to taste and pour into a large bowl, stir in peas (if using), and let cool. Oil a large 4L casserole dish. Spread one third of the Saffron rice onto base of casserole dish. Cover with half of the chicken curry. Sprinkle with 3 tbsp chopped coriander leaves and 3 tbsp mint. Put the rice into a heavy bottomed saucepan, which will allow the rice to at least double in size. Wash and rinse the rice four times, changing the water each time. Stir in cardamon, cloves, star anise, saffron threads and butter. Add enough water to just cover rice and bring to the boil. Once at the boil, cover tightly then reduce the temperature to a low simmer and cook about 10 minutes, until all the water has absorbed. The rice should be just tender. Immediately spread rice over a baking tray to allow to cool, fluffing & separating the rice grains with a fork as you remove from pot. Heat the oil in a large saucepan, add ginger, garlic, red chillies, cumin seeds, cardamon and cloves. Sauté until fragrant. Add the sliced onions and fry on medium heat until the onion is soft and caramelised, about 10-15 minutes. Add the chicken and salt and sauté until just sealed. Stir in turmeric, chilli powder and tomatoes. Cover and cook on medium heat for 20 minutes. Add water if mixture becomes dry at any point. Add yoghurt, garam masala and green chillies and continue to cook for 20 minutes, or until chicken is cooked through and oils have started to appear on the surface as an indication that the chicken is cooked. Remove from heat and stir in peas if using. Oil a large 5L casserole dish.Spread one third of the Saffron rice onto base of casserole dish. Cover with half of the chicken curry. Sprinkle with 3 tbsp chopped coriander leaves and 3 tbsp mint. Spread remaining rice over chicken and cover tightly with alfoil. Heat in a 180C oven for 35-45 minutes, or until warmed through. Leave to rest, covered for 15-20 minutes. 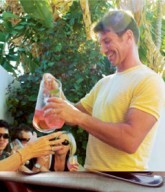 We hope you enjoy our recipes! Please don’t hesitate in letting us know how it went for you and should you have any questions about any of the steps or any of the recipes, please don’t hesitate in contacting us at enquiries@urbanprovider.com.au.